A beautifully styled aluminum sunshade can transform an ordinary building into a modern, eye-catching structure. 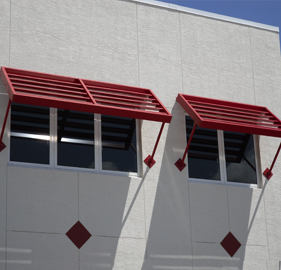 Perfection Architectural Systems sunshades offer an eco-friendly and aesthetically pleasing aspect to your building. Buildings with sunshades not only have more curb-appeal, but they also help lower operating expenses. Energy bills are lowered because sunshades decrease solar absorption by redirecting and deflecting sunlight away from windows, making the inside of the building a more moderate temperature. Not only do sunshades add value and aesthetics to buildings for clients, but they also can improve employee productivity and satisfaction by providing a more comfortable working environment. Aluminum sunshades provided by Perfection Architectural Systems are cost-effective and lightweight and can be installed almost anywhere on commercial buildings. 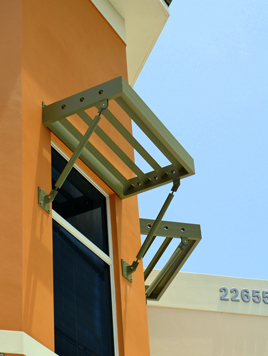 We provide sunshades in standard and custom finishes, ensuring that they match the color and theme of your building. All of our shades have an extremely durable finish that will last for many years, with very minimum maintenance. They are made with high-quality, recyclable materials and expert workmanship. 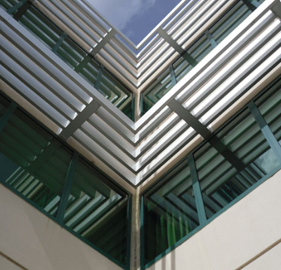 Perfection Architectural Systems is committed to being environmentally-friendly, that’s why we use aluminum, which is 100% recyclable, and can be reused and reshaped again and again for use on future projects. Our sunshades help your business become more energy efficient by reducing exposure to direct sunlight while allowing ambient lighting to come through. 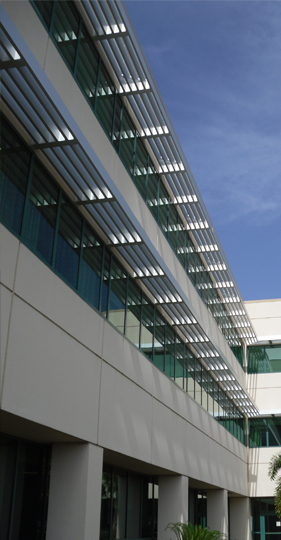 Stay cool with low-maintenance aluminum sunshades for your next building project. Experience the difference with Perfection Architectural Systems and our commitment to sustainable business practices and green building strategies . Call us today to add sunshades to your commercial structure. Choose from a variety of styles and colors designed to match the architectural look of your building. For more information about our products and services, please call us today at (407) 671-6225 and we will be happy to assist you.